Before heading out for your next round of golf, I want you to consider why you’re going out to play. What I mean is to think about what you hope to gain from the round. It’s important to make sure you’re setting your expectations on something you can actually deliver. A task you may be overlooking is identifying the one important thing that will make a difference in your next round. What would be on your list? But you’ve got to make sure that you set your expectations around an element of your process that actually contributes to those types of desired outcomes. If you’re at a loss for what to pinpoint, let me give you 5 practical examples to help you identify that one important thing in your game. Do any of those examples target areas where you could use some improvement? By taking the time to consider your past performance in an effort to identify a minor improvement goal for your next round, you’ll position yourself to move the needle in your game and make some sustainable gains over time. Just remember that your “one important thing” must always be something that you directly control, as there are many uncontrollables in golf — score included. If you struggle with consistency on the course, but hit a lot of good shots on the range, your challenge is with your mindset, not your mechanics. Consider investing in developing your mental game skills to unlock your best game, especially under pressure. 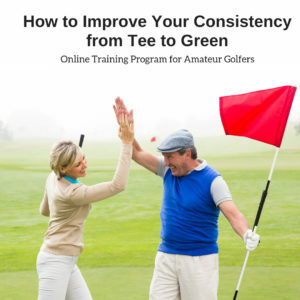 You can now train with me online through my new program, How to Improve Your Consistency from Tee to Green. For more information on the next enrollment period, CLICK HERE. The next time you are faced with a challenge in your game, take an approach from a place of patience and acceptance. Remember that it’s through failure and adversity that we often learn and grow the most. Got questions about your game? Leave me a comment below and I’d be happy to help. My problem after all these years in golf is that I can’t stay down there with the entire swing and that end up toping a lot of balls. That is so basic but it continues to be a serious problem that affects my game. I doubt you can fix that but if you have a thought I would be grateful. Hi Sara! Thanks for sharing your struggle. In my experience, the main reason golfers lift up in their swing is because they lack trust in their shot and want to peek to see the shot unfold. I encourage you to really examine your thought habits as you plan and prepare for each shot to make sure that you 100% committed to the shot, feeling very confident in your ability to execute the good shot you’ve planned, and have rehearsed a good swing maintaining the correct stance through the shot BEFORE you step in and address the ball. If you are swinging with self-doubt then the problem will likely persist. I hear from many we play with “Your practice swing was perfect so why can’t you do that when you hit the ball”? I’ve had so many unsolicited advice and opinions that I feel deflated. Hi Patti! Thanks for sharing your question. I have heard that from so many clients, and the main reason is the freedom in a practice swing due to the fact that for so many golfers “it doesn’t matter” or “it doesn’t count.” The truth is that it should count just as much as the actual swing when there’s a ball at your feet. Some golfers struggle to take their good swing from the range to the course for the same reason. On the range, shots don’t count, so there’s no self-imposed pressure to perform. But then golfers tend to change the rules on themselves when they get on the course, and now every shot does count. Think about it this way…what’s your job? Your job in golf is to make a good swing or stroke, not to hit the ball. So just as you focus on making a good practice swing, don’t change your goal when you change your position and address the ball. Just swing like you just rehearsed and trust that the ball will get caught up in your swing. Take the pressure off yourself around trying to hit the ball.